Subscribe to comments with RSS or TrackBack to 'How many uses for duct tape can we count?'. I carry about 4 feet of duct tape around my water bottle. A couple of weeks ago I had to use it to immobilize my knee (I had damaged three ligaments and fractured my tibia after about a 10 foot fall). I too wasn’t too fond of the thought of peeling duct tape off my leg, so I wrapped a garbage bag around my leg first. That gave me enough support to hobble down the mountain and spared me the pain of ripping out leg hair. Securing: When folded over lengthwise, duct tape does a fine job replacing broken backpack straps. The most recent use I’ve seen of duct tape, which a Pacific Crest Trail hiker said only proved that he tried to get too many miles out of his old hiking boots, was the tape wrapped around a shoe to keep the sole on. Just wondering, could you hang duct tape in strips to catch mosquitoes (like flypaper)? Now that would be cool! Pants repair. 😉 Very klassy of course! Duct tape? I came up with 60 uses. 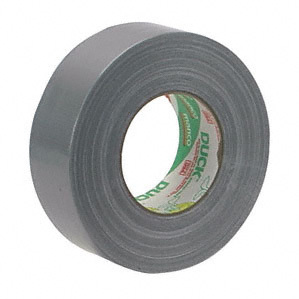 When using duct tape for medical purposes, you can often apply a piece outside in first (shiny side against the wound) then adhere it with additional strips. Pulling out leg hair is bearable, pulling new skin off a healing wound is not so fun. I’ve put it over blisters to stop the contact of the rubbing. Add a couple inches to each side of your tent’s emergency pole repair sleeve, and if/when you need to use it you wil be more than greatful that you don’t go hunting for it! I fixed a hole in the mesh of my tent just a couple days ago with a piece of duct tape. No more sneaky mosquitoes! Ha ha, just found this article. Some great ideas here. On the link below is a pic of a pair of boots we saved with duct tape a couple of weeks back. They were 12 years old! Camouflage-to not attract animals when you use it. You could use it if you are stranded since it reflects light, also making beds. Also you could make underwear/bras.